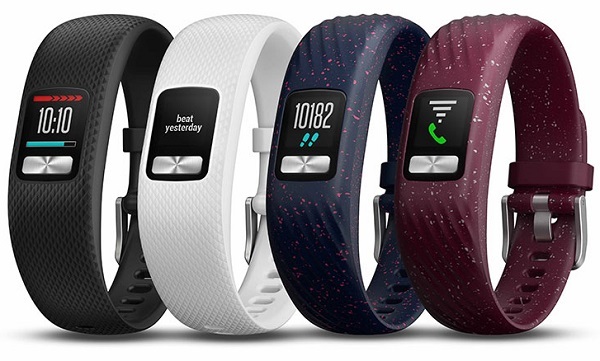 GARMIN launches vívofit 4 activity tracker with always-on color display and 1+ year battery life. Garmin today announced the vívofit 4, a daily activity tracker with an incredible 1+ year battery life - no charging necessary - and a sunlight-readable, always-on color display. Designed for 24/7 wearability, the vívofit 4 is swim- and shower-safe and features a sleek, comfortable band. The vívofit 4 is ready to go right out of the box, and can be paired with a smartphone for additional features. Right out of the box, the vívofit 4 starts tracking steps and encourages users to stay active with a colored move bar that fills up when a user has been stationary for too long. It also assigns daily step goals based on current activity levels which automatically adjust to the user, gradually nudging them toward a healthier, more active lifestyle. For those customers looking for more than just basic activity tracking, the vívofit 4 can be paired with a smartphone, adding even more functionality and options, such as tracking sleep, intensity minutes and more. Forget to start or stop a timed activity? Thanks to Move IQ, the vívofit 4 is able to detect changes in a user's movement and automatically capture and classify activities such as walking, running, biking, swimming and using an elliptical. Users can use the vívofit 4 as their everyday watch, complete with a countdown timer, stopwatch and multiple alarms. A weather widget gives a quick, illustrated look at the day's weather. The vívofit 4 even includes Find My Phone for those who need a little extra help keeping track of their smartphone. Through the Garmin Connect app, users can customize the vívofit 4 with various watch faces, color themes and personalized text, such as an emergency contact or motivational phrase. Interchangeable accessory bands (sold separately) make it easy to switch up colors and styles to match any mood or outfit. Within the newly redesigned Garmin Connect, a free online community, it is easier than ever to get an at-a-glance look at important stats like steps and sleep. Users can filter and customize their data so that they are only seeing what is most relevant. Users can connect with friends and family to motivate one another, join challenges, engage in friendly competitions and more. And speaking of competitions, vívofit 4 users with children who own vívofit jr. 2 devices can compete against one another using the Toe-to-Toe timed step competition feature to determine who is clearing the table that night. The vívofit 4 will periodically sync with Garmin Connect throughout the day. The vívofit 4 is available in White (S/M), Limegreen Speckled (S/M) and Black (S/M and L) for a suggested retail price of $79.99, available on Amazon.com today. Interchangeable accessory bands are available in a Speckled Merlot and Speckled Navy combo pack (S/M) for $29.99. Accessory bands in Speckled Black (S/M), White (S/M) and Black (S/M and L) are available for individual purchase for a suggested retail price of $19.99.